Features in detail. New stock is ready now. Press the SOS help button and the pendant will beep for 15 seconds. If you don’t click the SOS button in that time to cancel then the pendant begins to call your contacts in your chosen order. 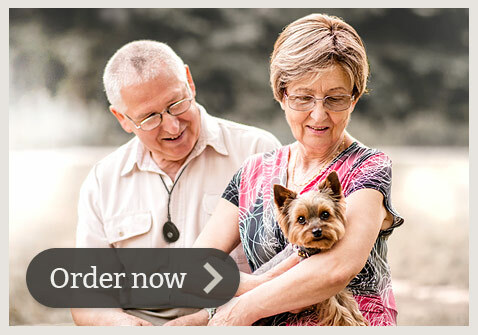 The wearer talks and listens hands free through the mobile alarm pendant. As well as calling all contacts the pendant will send a help text message to each person when the contact number is a mobile phone. You can choose to have no calls and text message alerts only. Each of the help text messages contain a link to Google Maps with the pendant location via the inbuilt GPS. Location accuracy of 2 metres: more accurate than an iPhone 6. If you wish you can make ‘911’ as one of the emergency contacts for the help call. ‘911’ will not receive the help text message though. ‘911’ will know the position of your alarm through their “enhanced 911 system” if they receive a call from the pendant. Hands free communication through the in-built microphone and speakerphone with clear, high quality audio. At any time the wearer can press the side talk button and make a call to a nominated contact using the speakerphone mode. It’s easy to make the side call button call any one of the nominated contacts. Someone can call the mobile phone number of the pendant and talk to the wearer through the in-built speaker and microphone. The alarm pendant will ring once and then will answer automatically. There’s no need to press any buttons. If you wish to you can send a simple text message to the pendant and you will receive a reply text showing the wearer’s location on Google Maps. Accurate to within 2 metres. The Mobile Alarm’s contacts be can easily changed by sending text messages to it’s mobile phone number. The Mobile Alarm contains a fall detection feature. When a fall is detected, it will vibrate and beep for a short time to allow the wearer to cancel the fall alert if it was a false alert. If they don’t cancel the alert then the pendant will start sending text messages and making the SOS-help call. You can choose to have a ‘low battery’ warning text message send to the first contact when the battery falls to 12% charge. The default is that the ‘low battery’ warning is on. This can be turned off by an easy text message. The Mobile Alarm has a Geo Fencing feature that allows warning text messages to be sent if the wearer strays outside a defined area such 200 metres or 5 km. Ideal for some people suffering from dementia. Please ask us for more information. There is no extra fee involved with this feature. After you receive your Mobile Alarm you are able to change settings and turn features on and off by sending simple text messages to the mobile phone number of the pendant. The Mobile Alarm is waterproof so it can be worn in the shower or the rain. It is also dust proof and can be used in dusty or rugged locations with care. The included charging station allows the wearer to pop it in there when it needs to be recharged. Many people keep the charging station next to their bed and recharge it overnight. Have some questions? Read our Frequently Asked Questions here.